The party has also decided to extend its support to CPI(ML) Liberation and CPI(M) in the Ara and Ujiarpur Lok Sabha constituencies, respectively. "We have already announced the name of Kanhaiya Kumar as our nominee from Begusarai. Today, the party's central secretariat gave its nod and formally announced Kumar's candidature from Begusarai. We have no doubt that he will become an MP," CPI national secretary K Narayana said. The party will field its candidate on the Khagaria seat as well, the candidature of which will be decided by the central secretariat on Monday. "We will support the candidates of the Grand Alliance in order to ensure the defeat of the NDA in the state on seats where the Left will not field its nominees," party state secretary Satya Narayan Singh said. 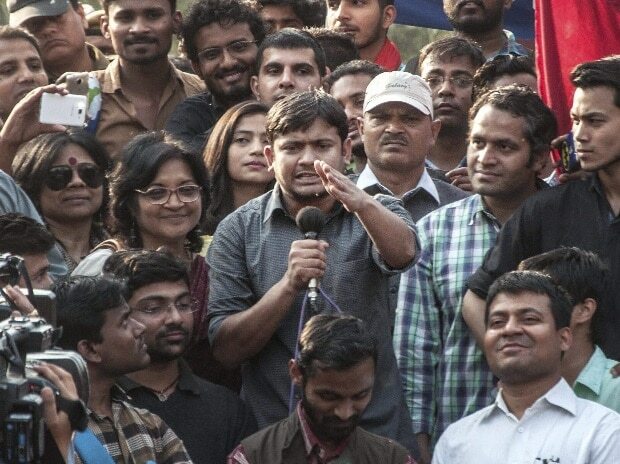 "Kanhaiya Kumar has become the symbol of fight against the Narendra Modi government in the past three years... We will ensure his victory," he asserted. Asked about the Left parties not finding a place in the Grand Alliance, Kumar said the Congress has already taken a decision to support secular democratic forces in order to ensure the defeat of the BJP-led government, and also to check the division of anti-Modi votes. "And hence, we have extended our support to the Grand Alliance, irrespective of what they have done," he said. Left parties of Bihar had on Saturday slammed the 'Mahagathbandhan' (Grand Alliance) for excluding them in the seat-sharing formula, saying the decision was not in sync with the ground realities in the state. The 'Mahagathbandhan' on Friday announced its seat-sharing formula for the 40 Lok Sabha seats in Bihar, half of which will be fought by the RJD and nine by the Congress. Terming Union minister and BJP nominee from Begusarai Giriraj Singh as a "visa minister", the firebrand student leader said, "I am fighting against Giriraj Singh and his fundamentalist thinking." The RJD, which is the part of the Grand Alliance, has not formally announced any name for the Begusarai seat so far.